Nia Hamm reports from Lowell, where a home was destroyed by a fire on Thursday night. 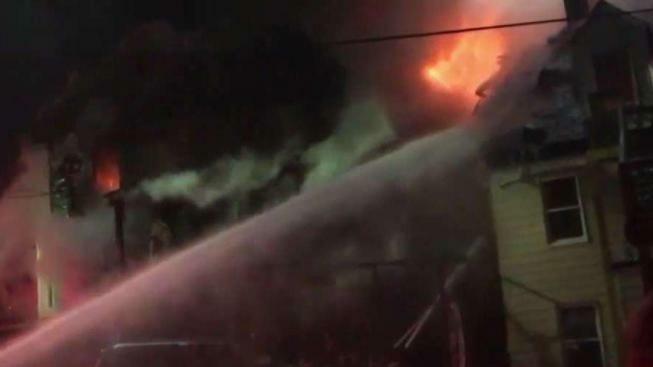 Plumes of smoke and flames shot into the night sky as firefighters rushed to save three homes and dozens of people impacted by a fire in a Lowell neighborhood Thursday night. "I think the only thing that was saved with anything that is fireproof because I don’t think anything else…it’s just done," said Sarim Chan. Chan’s mother lives on the first floor of a multi-family home on the corner of Sagamore and Arthur streets. "She was upset really upset," Chan said. Luckily, Chan’s mother wasn’t home when the fire broke out however, her mother’s boyfriend, Brownie Peou was home at the time. "It’s nothing you can save there," Peou said. "It’s empty." As families across the country were celebrating Thanksgiving in the comfort of their homes Thursday, Peou and about 25 other people in his neighborhood were being evacuated from three homes on Arthur and Shaw Streets. "So I come out in just the jacket but no car keys. So I just stand outside," Peou said. "That’s all I can do. I just watch and that’s it." Peou’s brother owns the multi-family home Peou lives in. Peou said his brother does have insurance on the home. Fire officials believe the strong winds helped spread the fire while frigid temperatures made it difficult for firefighters who had to deal with frozen hydrants and slippery ice. "The two houses that are a total loss are very close together," said Lowell Fire Chief Jeff Winward. "It appears as if the fire may have started in the back of one house and just spread to the other house." Two homes are completely destroyed and another home is damaged. All residents were safely evacuated. However, about 25 of people are now homeless. "I’m waiting for his brother to come so we can figure out what to do next from here," Chan said, referring to Peou’s brother. The Red Cross is assisting the displaced families. The fire remains under investigation. Fire officials say they’re focusing their investigation on Peou’s brother’s home.